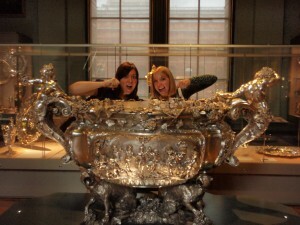 Today Sarah, Chelsea and I made a journey to the Victoria and Albert Museum. Upon immediately entering the V&A, we noticed that it was going to be a hodgepodge of all sorts of items. The first room we entered featured various nudie sculptures that caught our attention. Then to our right we noticed the “Fashion” exhibit. The “Fashion” exhibit featured everything from a 1700s brocade ball gown to futuristic designs. Being in a girly mood, we decided to go to the jewelry section next, we can dream can’t we? 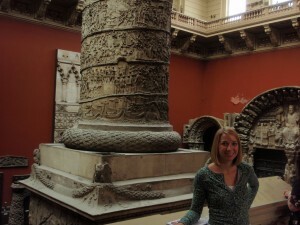 On the way, we stumbled upon an ironworks exhibit, gargantuan columns, and Asian textiles. 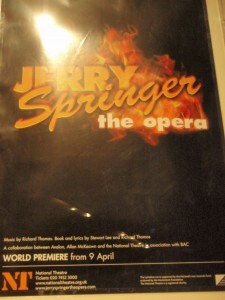 One of the best exhibits, we thought, was the Theatre and Performance gallery. This exhibition housed anything from ballet costumes to miniature set designs and various recordings of performances. This kind of exhibit, we felt, was rare compared to the other museums we had visited. Alli morphed by a gargantuan columnNo caption needed. As a whole, we felt that this museum showed more socio-cultural exhibits than the rigid British Museum and National Gallery. The 20th Century exhibit showed anything from an iMac to early cell phones. It included a section about technology as an astestic, featuring a pink vacuum cleaner from the 1970s. This museum tended to show more “everyday life” items rather than royal jewels and strictly upper class items that are less easy to relate to. Even the jewelry exhibit included less elaborate pieces, such as funerary rings, that did not necessarily belong to royalty or a famous name. These items weren’t just “dug up from the ground” and put on display, but they were placed in a better context. Additionally, the V&A seemed to be more “British,” containing the most number of galleries dedicated to English artifacts and history. They had 13 rooms entitled “British Galleries: 1760-1900” whereas the British Museum only had 2 rooms and the National Gallery had 4. It is interesting that these two museums are considered “national” museums and yet they have the least amount of national artifacts. Tagged: 20th Century, Art, Fashion, Jewelery, Theatre & Performance, Victoria and Albert, What is British? Great point about the V&A having more displays that focused on Britain then any other museum. I wonder why this is? Overall I sensed a tad bit of British nationalism in the Victoria and Albert. I also got the sense that they displayed whatever they wanted to and weren’t trying to cater to any particular crowd. Personally I found this admirable and I think this is part of the reason why so many people enjoy it. The other reason this museum is so well enjoyed is that it has, as you so aptly put it, “a hodgepodge of all sorts of items”. This fits in perfectly with the 21st century mindset. Because of our short attention spans and need for variety this museum achieves what many fail at, a wide array of exhibits that touch on a multitude of different interests.